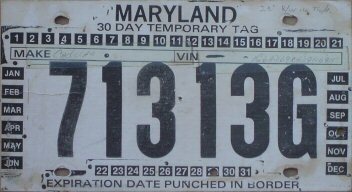 On this page are photos and information about Maryland license plates valid for short periods of time, including cardboard temporary plates and special event plates. August 22, 2017 – Added a photo of a 1995 Papal Visit Official special event plate. February 6, 2015 – Brand new page! This page addresses various kinds of temporary-use vehicle registration plates. 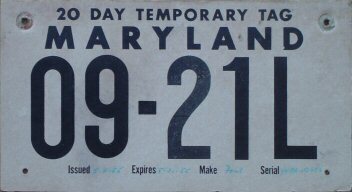 Unlike some other states, Maryland has typically indicated temporary registration with (nearly) full-sized license plate(s), rather than, say, temporary registration papers taped inside a window. 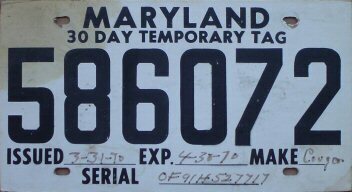 At least that's been the case since 1955; I don't know how temporary vehicle registration was handled by Maryland before then. My "Pictorial History" pages are intended to be a supplement to the information found in the ALPCA Archives. I am providing additional details and additional photos not found in the archives, and clarifying information when appropriate. When the ALPCA archives cover a subject in great detail, I do not repeat that detail here. I sincerely hope that you find this information useful. If you find an error or have additional information, or can provide a plate or a photo of a plate that I'm missing, please send me an e-mail. There's a link to my e-mail address at the bottom of every page. Mouse over any image to see a description of the plate. Click on any image to see an enlarged version. Cardboard and paper temporary plates were and are issued by dealers to their customers who have purchased vehicles and are not transfering the metal plates from another vehicle. 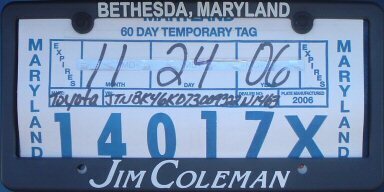 These plates provide time for the MVA to mail the vehicle owner their new permanent metal plates and registration documents. 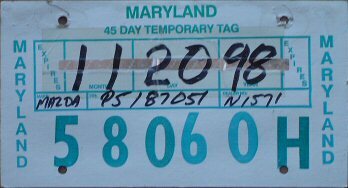 Unfortunately, I can't provide a detailed written history of Maryland temporary plates like I have done for other Maryland plate types. By their nature, temporary plates are only used for a short time and are usually then discarded, so not many old temporary plates have survived. They're not taken very seriously by plate collectors or historians, so there's little to no information written about them by others. And, to be honest, I just never paid enough attention to them myself that I can recall many details from memory. So, I'll just have to show you the temporary plates I've acquired or photographed in use and let the plates speak for themselves. 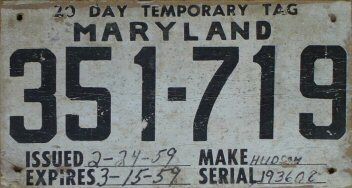 Cardboard temporary license plates from 1955, 1959, 1963, 1970, 1973, 1976, sometime in the 1980s, 1998, and 2006 (plate in actual use). 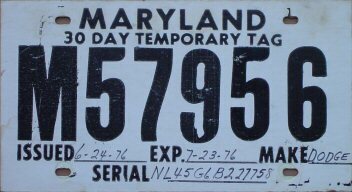 I don't know exactly when Maryland started using cardboard temporary plates. The oldest in my collection is from 1955. These were issued in pairs and were attached to both the front and back of most vehicles until the early 1970s; since then, only single temporary plates have been issued. Motorcycles were issued the same full-sized temporary plates as four-wheeled vehicles; however, I don't know whether that's still the case. Cardboard temporary plates were discontinued in favor of paper temporary plates some time between about 2007 and 2011. Plate number 09-21L was used in 1955 and was valid for 20 days. It was issued to a Ford on May 11, 1955 and expired on May 30. This plate measures 11 inches by 6 inches. Plate number 351-719 was used in 1959 and was valid for 20 days. It was issued to a Hudson on February 24, 1959 and expired on March 15. Hudsons were last made in 1957, so this was almost certainly a used car. This plate measures 11 inches by 5 7/8 inches. Plate number A21-439 was used in 1963 and was valid for 20 days. It was issued to an Oldsmobile on February 28, 1963 and expired on March 19. This plate measures 11 inches by 6 inches. Plate number 586072 was used in 1970 and was valid for 30 days. It was issued to a Mercury Cougar on March 31, 1970 and expired on April 30. This plate measures 11 inches by 6 inches. Plate number C68069 was used in 1973 and was valid for 30 days. It was issued to a Toyota on January 17, 1973 and expired on February 15. This plate measures 11 inches by 6 inches. Plate number M57956 was used in 1976 and was valid for 30 days. It was issued to a Dodge on June 24, 1976 and expired on July 23. This plate measures 11 inches by 6 inches. Plate number 71313G was designed to signify the expiration date by punching holes in the appropriate printed month and day. It was valid for 30 days and expired on October 29. Unfortunately, there's no place on the plate to indicate the year, so I don't know in what year this plate was used. Based on the VIN, I know it was issued to a 1983 Cadillac Sedan de Ville. This plate measures 11 inches by 6 inches. Plate number 58060H was used in 1998 and was valid for 45 days. It was issued to a Mazda and expired on November 20, 1998. This plate measures 10 7/8 inches by 5 7/8 inches. Plate number 14017X was used in 2006 and was valid for 60 days. 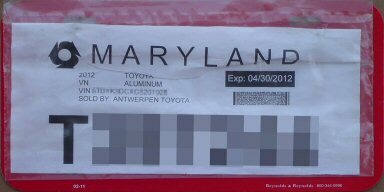 It was issued to a Toyota and expired on November 24, 2006. Since I photographed this plate in use and it has a frame around it, I don't know its dimensions. 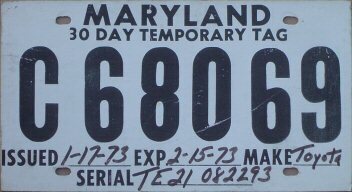 A few years ago, Maryland began issuing these silly paper "plates", as shown above, as evidence of temporary registration. I'm not exactly sure when this started, but it's been at least since early 2011. The registration number consists of the letter "T" followed by a six-digit number. These are printed on a standard 8 1/2" by 11" sheet of white paper, which is then folded or cut in half. This particular temporary paper "plate" was placed inside a plastic bag and taped to a dealer's booster plate. I don't understand how those in authority could possibly think that computer-printed temporary registration "plates" on plain white paper are a good idea. Anyone with a computer, a printer, and image-editing software could easily make their own fake "plate". Since the "plate" shown above was issued to my sister, I've chosen to hide the registration number, so that someone doesn't use this photo as the basis for a fake plate that could be associated with her in the MVA database. This is a relatively recent developlment, though I don't know when the practice started. Motorists who try to title and register a vehicle that hasn't recently passed inspection are issued regular passenger car plates with expiration stickers only one month in the future. This could happen if one bought a used vehicle from a private seller, for instance. The plates give the motorist a way to drive the car to get it inspected and have any necessary repairs made. Once the vehicle passes inspection, which the vast majority do, the motorist is able to obtain sticker(s) showing a normal expiration date two years out. I happen to know for a fact that the above plate showing an August 2011 expiration was issued in July 2011 to a newly titled, uninspected vehicle. The car never did pass inspection and was junked or sold for parts, and so subsequent expiration sticker(s) were never applied to the plate. 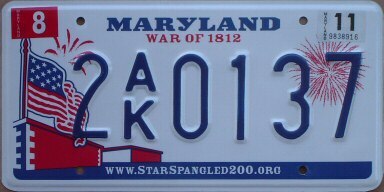 Normally, plates issued in July 2011 would have natural July 2013 expiration stickers. Special event plates are state-issued or state-sanctioned vehicle registration plates that are used for a limited period of time in conjunction with an event of some kind. 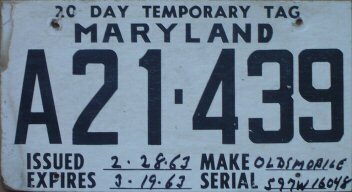 I know Maryland has issued some, but very few special event plates over the years. 1939 special event plate for a Shriners Convention held in Baltimore (Sallmen photo / plate); 1995 special event plate for Pope John Paul II's visit to Baltimore, issued to event officials (Gillis photo / plate). I can't say with certainty whether the 1939 Shrine Convention plate shown above is a legitimate special event plate authorized by the state. The fact that it indicates an expiration date (July 1, 1939) gives the appearance that it's the real deal, but I just don't know. 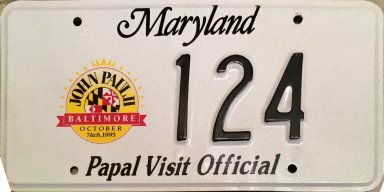 The only other Maryland special event plate that I know for sure was issued and used was this Papal Visit Official plate for Pope John Paul II's visit to Baltimore in 1995. These were not available to the general public, but, as best as I can determine, were issued to vehicles used by Roman Catholic Church officials who were temporarily in Maryland making arrangements for the Pope's visit. Thanks to those who have directly contributed to the information on this page: "Tiger" Joe Sallmen, Alan Gillis. Sallmen and Gillis photographs are presumed to be copyrighted by "Tiger" Joe Sallmen and Alan Gillis, respectively, and are used with permission. All text and photographs © copyright 2006, 2007, 2009, 2012, 2015, 2017 by Rick Kretschmer, except where noted. All rights reserved.